Studies have shown that indoor air can be 2 to 5 times more polluted than outside air. Most disposable filters only remove about 10% of these pollutants such as dust, pollen, mold spores, animal dander and much more. These materials collect in the furnace, air conditioner and ducts, just as they do on your furniture and other surfaces. These pollutants can migrate out into the room again, or help promote the growth of mold and bacteria, which can release mold spores or toxins into the air system. These spores can trigger allergic or asthmatic reactions. Long term exposures to low levels of some mold toxins can result in permanent chemical sensitivity to common compounds in the environment. We vacuum the interior of the furnace/air conditioning unit, clean the cooling coils using a HEPA vacuum and coil cleaner, and then finish by cleaning the blower unit. K and L removes, cleans, and then rinses all wall, ceiling, and floor registers. 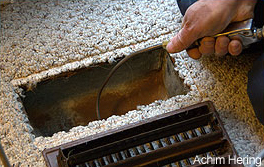 We clean all air duct with our powerful, specialized duct cleaning equipment. Next we decontaminate the ducts with a special sealant and treat them with a deodorizer. Finally, after everything in your system has been thoroughly cleaned we install a solid deodorizer in the return that controls odors for up to 3 months.